Often considered the archetypal whale, the sperm whale was subject to intense whaling during the 19th century, and again from the 1950's to the end of the 1970's. Prior to commercial whaling, 1.1 million of these great animals roamed the world's oceans. When the last sperm whale was harpooned, around 360,000 remained. 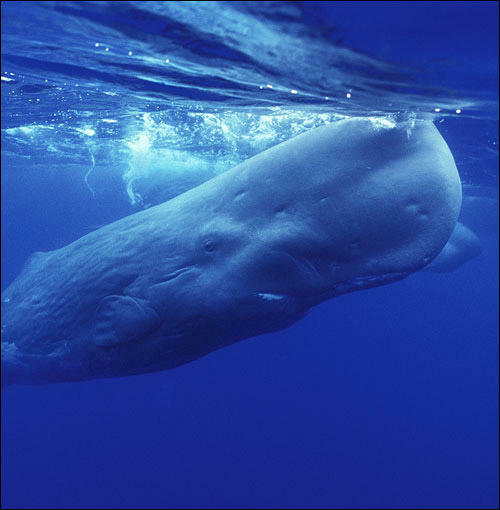 No longer exploited, the sperm whale is considered Vulnerable by the IUCN. THE FAMILY LIFE OF THE SPERM WHALE: Sperm whales are very communicative, highly intelligent and extremely protective of their young. Find out more. THE RICHES OF THE SPERM WHALE: Commercial whalers sought the sperm whale for its fine oil, dark meat, unique spermaceti and mysterious ambergris. Find out more. THE RAGE OF THE SPERM WHALE: Not a whale to go down without a fight, the sperm whale earned a ferocious reputation among 19th century whalers. Find out more. THE END OF SPERM WHALING: The shy, cerebral sperm whale was at the forefront of the movement to end commercial whaling. Find out more.